Thumbnail Creation Tricks: Applying Logos by Using "Stamps"
I am not a good artist. As a TAYer, that means putting together decent thumbnails for all these articles is often a challenge. However, with enough experience and frequency of practice, I’ve developed some good habits which at least help make that task easier. I’d like to share one of them. For this post, I want to talk about the practice of creating a “stamp” that can then be utilized to place a logo on as many images as possible. In relation to one of my own recurring series of articles, my RedStripe Loved Trax music posts, this allows me to quickly and easily apply the text logo across the many many thumbnails that the series entails. So, to begin! Let’s say that there is a type of article—for example, perhaps game or anime reviews—that you often write. In order to quickly distinguish these articles, maybe you are looking to mark them with some kind of logo? Maybe it will be a little picture? Going even simpler, maybe it will be a little piece of text that’ll get slapped onto a thumbnail? Even in this case however, you might still be looking to keep the appearance of your intended text consistent: Same typeface, same font size, same text color, same text spacing, all of that jazz. You could just manually type in that text and apply all of those settings every time you make a thumbnail, but that would be a lot of tedious and repetitive effort to go through for something that will always stay the same. Regardless of how the logo will ultimately manifest, you can make things way easier on yourself by adding it into a “stamp.” In this context, the way I am defining it, a stamp is a transparency-supported file, saved in the project format of your image-editing program of choice, containing an artistic asset meant for usage across a multitude of images. In my case, I have a logo, derived from when I used to do video stuff on YouTube, for my series of music posts. It’s just some text in a shade of red, but with the rare exception of text color, I want its appearance to stay exactly the same. To accomplish that, I made a .xcf file in GIMP called “LovedTraxBanner” where I put together the logo, and then micromanaged its appearance until it was the precise way I wanted it. With that in place, whenever I need to create a thumbnail for one of those music posts, I open LovedTraxBanner.xcf alongside the GIMP project where the thumbnail is made. That then becomes the source from which I can stamp the logo, so to speak, on the thumbnail. For reference, this is what LovedTraxBanner.xcf looks like when opened up. In my case, it’s just text arranged in a very particular way, set against a transparent backdrop; note that the Background layer is set to not be visible. As for exactly how to make your own logo? Well, artistry is nowhere near my strong suit, so I don’t have much to offer in the way of that. The sky is the limit as far as how you want to make your logo look. Go to town on whatever you feel like would make your thumbnails most effective! Yours might be far more elaborate and way better than mine! Create the logo, save it in your preferred image editor’s file format, and that file shall now serve as your stamp for any number of pictures. In lieu of artistic recommendations, I have a couple of workflow recommendations instead. First, make sure you have a transparent backdrop in your stamp. That way, you won’t be confined to only making square or rectangular logos whenever you apply them to your pictures. Second, it is absolutely best to save your logo in an image editor project format, NOT as just an image file saved with a transparency-supported format like .png. Doing things this way has a couple of benefits. For one, this makes it much easier to copy the logo with all of the intended transparency included; something like Microsoft Paint tends to fill in a color wherever the transparency is supposed to be, for example. Additionally, you will save yourself a world of headaches by already having an image editor project of your logo to start from if you find later on that you want to adjust it. It could even be helpful if you want to derive another logo from it; maybe it’ll look largely the same but have different text? Just make a copy of the stamp file with another filename, then go to town and edit the copy. A second stamp made easy! So, once the stamp now all made, that leads into the next question: How do we apply it? Let’s get into that. I will be using the example of a prospective Loved Trax thumbnail for all of the how-to pictures. Additionally important to note is that the instructions will specifically cover GIMP only, as that is my personal editor of choice; you can’t beat free, after all! However, the underlying concepts behind what happens in GIMP should still translate reasonably well enough (fingers crossed) to other image editors. To begin, let’s say you have the rest of the thumbnail all read to go, with the logo as the last piece that needs adding. 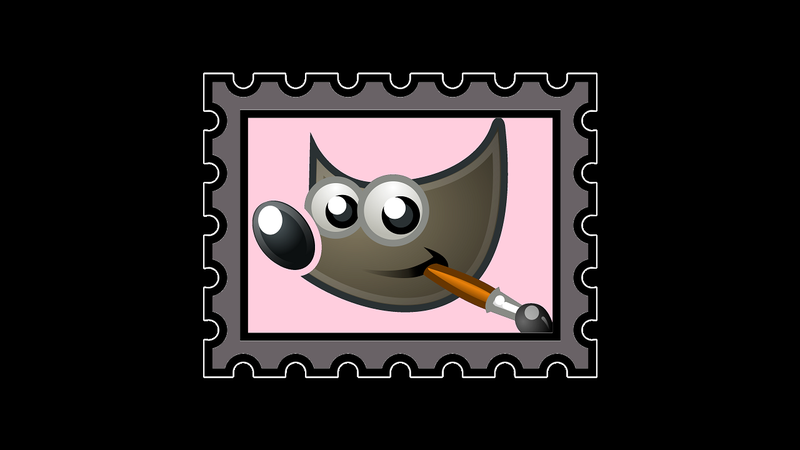 First, open the image editor project file serving as your stamp, e.g. LovedTraxBanner.xcf in my case. In GIMP, after verifying that it looks good, particularly where logo transparency is concerned, go to Edit, then select Copy Visible. This will copy the appearance of the image as displayed on screen, including any transparency. Next, with your logo copied, go back to the image editor project where you are putting together your thumbnail. Add a new layer, and make sure it is the topmost layer of the entire project. After verifying that the currently highlighted layer is the newly added top one to the Layers list, Paste what has been copied; your logo should now be in the thumbnail, ready to be positioned. From there, you can move the logo wherever you want. In GIMP, you can do that with the Move Tool. After you’ve moved it to the place you want it, get out of the selected region area. In GIMP, you can do that by either choosing the Rectangle Select Tool and then clicking somewhere outside of the selected region area or choosing Select from the top menu and then None. For my example thumbnail, this is where I ultimately chose to put the Loved Trax logo. Wallah!! Stamp applied! You should be all good to go! Export your thumbnail to the image file format of your choice—I use .png—and it shall be ready for use. In my own personal workflow, however, that is not where the Loved Trax thumbnail creation process ends. You may notice that the logo as it currently exists is a bit...plain. Thus, in order to spruce things up a bit, I apply an outline to the text after it has been positioned in the thumbnail. However, that outline is not included as part of my stamp, to which you may reasonably ask “Why?” That is because I apply the outline only after placing the main part of the logo into the thumbnail. I arguably could made that as part of the stamp in the first place, but I prefer to set my outline colors to something complementing the rest of their thumbnails, and I think it’s easier to do that while creating the thumbnail itself. As for how those outlines get added? Well, that would be a topic for another time.